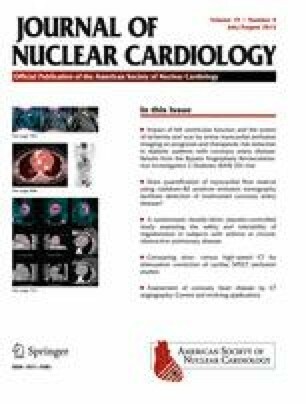 Does quantification of myocardial flow reserve using rubidium-82 positron emission tomography facilitate detection of multivessel coronary artery disease? Relative myocardial perfusion imaging (MPI) is the standard imaging approach for the diagnosis and prognostic work-up of coronary artery disease (CAD). However, this technique may underestimate the extent of disease in patients with 3-vessel CAD. Positron emission tomography (PET) is also able to quantify myocardial blood flow. Rubidium-82 (82Rb) is a valid PET tracer alternative in centers that lack a cyclotron. The aim of this study was to assess whether assessment of myocardial flow reserve (MFR) measured with 82Rb PET is an independent predictor of severe obstructive 3-vessel CAD. We enrolled a cohort of 120 consecutive patients referred to a dipyridamole 82Rb PET MPI for evaluation of ischemia neither with prior coronary artery bypass graft nor with recent percutaneous coronary intervention that also underwent coronary angiogram within 6 months of the PET study. Patients with and without 3-vessel CAD were compared. Among patients with severe 3-vessel CAD, MFR was globally reduced (<2) in 88% (22/25). On the adjusted logistic Cox model, MFR was an independent predictor of 3-vessel CAD [.5 unit decrease, HR: 2.1, 95% CI (1.2-3.8); P = .015]. The incremental value of 82Rb MFR over the SSS was also shown by comparing the adjusted SSS models with and without 82Rb MFR (P = .005). 82Rb MFR is an independent predictor of 3-vessel CAD and provided added value to relative MPI. Clinical integration of this approach should be considered to enhance detection and risk assessment of patients with known or suspected CAD. See related editorial, doi: 10.1007/s12350-012-9530-0. RSBB is a Career Investigator supported by the Heart and Stroke Foundation of Ontario (HSFO). MCZ was a Research Fellow supported by University of Ottawa International Fellowship Award and, the Molecular Function and Imaging Program (HSFO Grant # PRG6242). BC is supported by a CIHR New Investigator Award #MSH-83718. The authors thank the staff in the PET unit for their dedication to patient care and research. RdK, JR, and RK receive revenue shares from the sale of FlowQuant, the analysis software used in the study. RB, RdK, and RK are consultants with DraxImage. RB and RdK have received grant funding from a government/industry program (partners: GEHealthcare and MDSNordion). TDR received grant support and honoraria from GE Healthcare and MDS Nordion. RB is a consultant with Lantheus Medical Imaging. Benjamin Chow receives research support from GE Healthcare, Pfizer Inc and AstraZeneca, fellowship training support from GE Healthcare and educational support from TeraRecon Inc.